Reality Training for Children Part 2: What? This article is about reality training for children. I found it to be a great in-depth article on a very important and potentially controversial issue. Part 1 was a big hit with visitors to this site and I'm very grateful to Jamie for agreeing to post the this second part here. 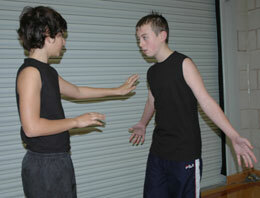 Previously I discussed the social barriers that often stand in the way of teaching children realistic self-protection. In this article we look at what I believe we should be teaching children in the context of realistic self-protection, but first let us look at how these barriers, if we let them, severely impede our honest intentions. It should be noted that these barriers are often reinforced by sound arguments and therefore should be seriously considered before anyone approaches realistic self-protection training for children and teenagers. The three main arguments can be roughly categorized into physiological, mental and ethical debates. I have explained them in descending order of importance. Firstly there is the undeniable obstacle presented by child physiology. Put quite simply, children are not fully developed physically so they are a lot more vulnerable than adults if they engage in any form of heavy contact training. Secondly we have the mental argument over a child's reasoning capabilities. Some argue that children do not understand the responsibility of pulling certain techniques when working with a fellow training partner. Then there is the supposed moral argument. Children are routinely instructed by well-meaning adults to never to hit first - if at all. Okay, so if we take these arguments at face value that leaves us with light or no contact training, positional training but no potentially lethal techniques to be taught and methods only to be taught in a reaction-based way. Better still, as an extra insurance policy, how about finishing each lesson by telling the children they must never try to use what they have learned ever! When going through these principles let us remember a few other things regarding these issues. Children have enjoyed organized and sometimes compulsory full-contact activities, such as rugby, throughout modern history and up to the present day. Rugby is a great form of attribute training for self-protection anyway. Where else do you develop such tenacity along with mental and physical strength, measured against multiple resistant participants? Furthermore its objective is focused on escape. On the subject of teaching children the hard facts of life, there is already an excellent tradition in children's groups that lay down the general foundations for independence and responsibility: the Brownies, Cubs, Guides and Scouts. These clubs often test children in supervised wild environments. When operated correctly these are brilliant examples of institutions that teach children the bigger self-defence picture. I put across the point that realistic self-protection for children requires no more from a student than you would expect from a synthesis of the mental survival skills taught at traditional children's activity clubs and the physical demands found in contact rugby. Therefore a fair risk assessment could not draw any hazards - physically, mentally or ethically - that fell outside the scope of these activities. 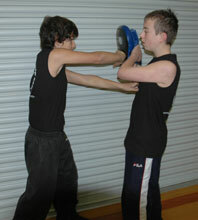 The "hard skills" or physical area of self-protection training is a tough one when it comes to teaching children. I am not going to dispute this. Furthermore, if we are being honest, the very real limitations presented by children - never mind the social ones - greatly highlight the importance of learning and teaching "soft", or non-physical, skills. This area must not only overlap the "hard", or physical, skills area it must underlie it and clearly define its objectives, objectives that are deeply set in firm principles and ultimately rooted in commonsense. If what we are discussing is self-protection, then the issue we are dealing with is making vulnerable people less vulnerable. Look to nature. Nature tells us that a prey animal's most popular and efficient means of defence is escape. In fact, many prey animals are designed to be fast and agile movers. Escape must be the priority of any self-protection "hard skill" training structure and this means reinforcing it at as often as possible in training. Although lack of strength, speed and experience are obvious disadvantages a child possesses when facing his most common enemies, a child also often has one obvious physical advantage that lends perfectly to escape and avoidance. Children are often smaller than their predator, be it a larger child or an adult, and although they may be outrun over a long distance they can use their diminutive size to out manoeuvre an attacker to access a suitable exit. Personal space is becoming a buzzword in schools today. Teachers use it to help teach children self-respect and respect for others. Inappropriate behaviour, such as unsolicited physical contact, can then be quickly identified by a child when he understands that his "personal space" is being threatened. The concept provides us, as self-protection teachers, with the perfect link to teaching children pre-emption. Understanding the "fence" (a term coined by reality martial arts pioneer Geoff Thompson) is to understand the bridge between soft and hard skills. The fence provides a decisive boundary that a child can use to gauge the physical intentions of another. Boundary is another key word. We often hear child psychiatrists, psychologist and behavioural experts state that children need and subconsciously want boundaries to feel secure. They are generally talking about intangible guidelines. This is often referenced when experts discuss the importance of parental discipline being used as a moral, social and security guide. I agree that children do require parameters, in fact it underlines all my teaching methods, but I argue that this should not stop with a parent's list of no-no's. A child needs to understand where the line stops with other people as well as themselves. "The Safe Zone: A Kid's Guide to Personal Safety" by Donna Chaiet and Francine Russell gives excellent advice to children on how to recognize their own personal boundaries. There is a lot of talk about empowerment these days in the martial arts community. Despite hyperbole about this being a fundamental part of traditional martial arts, the phrase was more than likely taken from motivational self-help gurus in the early 1990s. It was then quickly manipulated and its meaning corrupted by the founders of many a "quick-fix" system (such as the infamous Women Empowering Women pyramid-selling scheme). The expression eventually made its way into the world of corporate martial arts who adopted it in their advertising. Empowerment is appealing to the physically vulnerable members of our society, who often feel helpless at the thought of violence. Violence aside, these vulnerable people understand that their perceived weakness can and often does affect all other areas of their life. Parents understand this too and therefore were targeted by the "empower your child" advertising. Sadly, it is quite rare to see actual empowerment being taught in a martial arts class. Indeed, the direct opposite is represented. 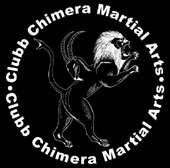 Look into the typical rules, tenets and ethical guidelines of a typical martial arts system, particularly one that claims strong militaristic links. You will find that it is often geared towards patriotism, loyalty and a very partisan approach towards the art's country, its religion, its culture, its teachers and the art itself. I do not mean to put down such values, but is it any wonder that many corporate martial arts instructors still forbid their students from training elsewhere? It is easy to target the corporate side of martial arts, the so-called "McDojos" or "white suit inc.", but in actuality even many who say they teach reality-based self-defence, are still resolutely reactive in their approach to fighting despite overwhelming evidence that this is an inefficient strategy in combat of any description. From a psychological and philosophical viewpoint a reactive mindset embraces the notion of dependency. So, if a school is centred upon teaching a reactive martial art, how can the instructor ever hope to empower his students? The answer is he doesn't. What he does is tell everyone what to do and when to do it. Therefore it only follows that children's classes are often even less reflective of the proactive philosophy. They are encouraged exclusively through material rewards and bribed through playing games in class that have no relevance to their actual core training. If that is not wholly effective then fear of the authoritarian black belt child and adult hierarchy is enough to control class behaviour. However, it is little surprising that we find the typical children's classes to be centred upon unrealistic self-protection methodology. After all the model for successful martial arts mass marketing can perhaps be traced back to when countries such as Japan made martial arts a compulsory part of their schools and the focus on training became geared towards self-improvement rather than self-protection. By contrast the fence, when taught properly, puts a child (or indeed any student) in a proactive mindset. Furthermore the child learns responsibility. The fence teaches a child how to hold their personal space and, just as importantly, not to violate another's. It is a simple boundary rule that anyone can use to assess another's physical intentions. The pre-emptive strike is only taught off the fence, so the justification for a child using it is always right. Before this I advise teaching children role-play to test their understanding of personal space, how to handle verbal aggression, taunts and deception. Furthermore verbalization skills are important, as children need to be able to shout to raise attention when put under pressure - especially if someone is trying to abduct or manhandle them. Once the fence is violated the concept of the "action-trigger" needs to be introduced. Isolation training methods should be introduced to address the actual striking. Although I believe children should certainly be taught how to form a fist and punch, repetitive heavy striking against a focus mitt with a bare hand is best advised to be performed with an open hand. The basis for this is two-fold. The obvious reason is that a child's bones are not properly developed and a palm heel provides much more protection than a fist. Striking can be alternated with a closed fist when bag gloves are worn. However, keeping a hand open also provides a student with greater versatility. As Mo Teague states, "a fist is a hammer, an open hand is a multi-purpose tool". At CCMA we teach all our students to hit a target until it stops becoming an obstacle and an escape can be secured. This is applied to most drills whether it is a focus mitt exercise or a specific resistance based game or sparring. I do not discuss the option of real fighting lightly with my students. There is no romance or glorification in its description and their understanding that it is the last resort is reinforced by the extensive work they do on de-escalating aggressive behaviour, using their fence and looking for escape in the pre-fight training. When it comes to handling the "hard skills" proper they learn very quickly about their own limitations and also the hard work involved when faced with the stress and the physical ardour of actually fighting. Having said this, resistance based training and pressure-testing is introduced as early as possible, so as not to allow mental barriers to form. 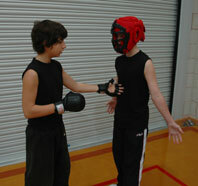 Sparring is handled in several different ways, often with restrictions to train certain areas. I try to remove the idea of the match fight, although I admit that it does form a good part of sparring training if only to build tenacity and, dare I say it in this post-PC climate, to toughen students up. All methods should have a section that deals with placing them under some form of controlled pressure. Grappling is a great form of full-contact training that involves less risk of injury than striking. Forms of strike-training are introduced fairly early, but these have to be gradually increased and carefully monitored. If there is one thing that today's youth crime has told us it is that the enemy we now face is more likely to come in numbers and be armed. There will be no honour of any description, there is dwindling regard for a person's reputation or physique and assaults will more than likely be of the recreational variety rather being motivated for avarice. In other words, no matter whomever you are if you are in the wrong place at the wrong time you can become a victim of an unwarranted violent attack. • Build-up Tig/Tag (A.K.A. Bulldogs) - teaches evasion skills and the importance of escape. Variations include breakaways and striking the focus mitt when grabbed. Start as a gentle game of tag. • Fence - teaches a huge variety of skills from understanding body language, to handling aggression and verbal abuse, but most importantly it teaches the concept of protecting one's "personal space" and the whole idea of setting boundaries. Distance needs to be adjusted when the child is trying to fend off an adult. • Strategy One versus Strategy Two - Played both in teams and on a one-to-one basis, this is a form of sparring where one person's objective is to keep the other person away (strikes only allowed) and the other to secure a body hold or takedown (grappling only allowed). It is a great isolation and pressure-testing exercise, also prevents playing by the same rules as your attacker. Start with open hand strikes and pushes only versus cover and hold. Grapplers should wear full protective head guards, including face cage, for a more intense game. • Code White Test - This name comes from Jeff Cooper's famous awareness colour code. All students have their eyes shut and open them as soon as they feel their fence has been touched or their personal space invaded in some way. They respond to what they see. It can vary from a focus mitt to someone grabbing hold of them. Perhaps one of the best adrenaline acclimatization drills you can do. Begin with just focus pad target awareness. • Tunnel of Death - Has variants throughout the martial arts world and usually surfaces around Christmas time. However, the best versions involve one student striking their way through a ground of focus pad wielding fellow students or those wearing boxing gloves. Begin with light contact, but make sure there is sufficient pressure for the student to cover. • Scramble Game - This is the grappling version of the Tunnel of Death and almost resembles a game of Rugby . One student tries to make their way across the mats to the end, starting on his hands and knees. It is important that he finishes standing up. Resistance can begin at 50% pressure to reinforce a positive outcome for the escapee. However, this should eventually be built up to full resistance. • Felt Pen/Knife Escape - This one can also be an eye-opener for the adults who think they can successfully handle a child with a knife. Students wear white t-shirts, safety goggles and use coloured markers as if they were attacking with a knife. Parents and teachers squeamish about discussing knives with children should be directed to reports on the regular knife amnesties at schools, as well as the huge rise in youth knife crime in this country. It is sadly very much a part of youth culture and therefore at least as relevant to them as it is to adults. • Ground defence sparring - This can be done with one student standing attacking another on the ground and also with one student pinning another. The object is for the grounded student to get to their feet and escape. Gradually increase resistance levels until it becomes specific sparring. • Boxing, Kickboxing, Wrestling and Mixed Martial Arts Sparring - These are brilliant honest sports, which can be appropriately adjusted for children. They teach resistance based development of basic fighting tools and above all toughen the survival instincts. • After class discussion - This is a very important area, where the whole real picture of self-protection can be explored by the teacher and the students. There are a lot of effective skills most children have already discovered before they even set foot in a martial arts class. Most will know how to pinch flesh, bite, pull back fingers and all the other "foul" moves that are not even permitted in the highest professional areas of Mixed Martial Arts/Ultimate Fighting. Such survival instincts need to be cultivated under careful supervision. I usually permit much smaller children to use these methods with control against larger students. They are very adapt at doing this and, by levelling the playing field a little, it encourage the larger students to up their game in areas where they have just used their weight and size to dominate. Any form of resistance-based training can prove to be a very difficult area with children. Many clubs have done away with the practice to save on tears, angered parents, injuries and possible legal repercussions. They have my sympathy. Bad experiences or going into heavy contact sparring too fast can put up strong psychological barriers and set back a student's self-esteem. A teacher needs to be patient, empathetic and observant at all times. For example, I knew one child who was a very natural grappler, but almost gave up training completely after a few sessions with the boxing gloves on. Sparring is a progressive process requiring a lot of trust on the child's behalf and empathy on the teacher's behalf in order to get the best out of a child. However, the benefits are exciting new discoveries that can be brought back and adapted into adult training. Children can be brilliant filters for efficient methods of self-protection, as they quickly expose the limitations of certain methods if they are not robust enough. Such methods can easily be overlooked in favour of the alpha male contests and martial academia that can easily develop in all-adult classes. However, by engaging children in the creative process you take martial arts training and the whole philosophy of self-protection right back to their primal core. Rather than just doing as you are told and passing on cosmetic teachings, you empower yourself, your fellow teachers and your students - but more about that in the next article.